Clear Skies - Lavender and Bergamot for a classy scent. Country Pumpkin (Seasonally Available) - Scented just like mom's pumpkin pie. Deep Ripple - A comforting blend of Lavender and Vanilla with Cornmeal for light exfoliation. 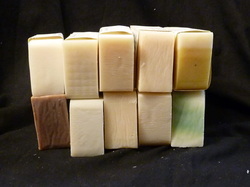 Goat Milk Soap - Unscented with goats milk & oatmeal for sensitive skin. Just Breathe - A blend of Eucalyptus and Cedar-wood with citrus undertones. Lavender Swirl - A delightful Lavender Oil soap with a purple swirl. Lemon Poppy Seed (Seasonally Available) - Has poppy seeds for exfoliating summer skin. Oh Baby - Calming Chamomile and Lavender paired with Rose Geranium. Scented like baby powder. Peppermint Swirl - An invigorating peppermint soap with a green swirl. Spring Showers - A flower bouquet - with Jasmine and Rose Geranium. Tickled Pink - A light, Pink Grapefruit/Citrus blend. Deluxe Facial Bar - A specially designed facial bar with anti-aging and anti-inflammatory properties from Frankincense and Myrrh. Deluxe Facial Bar - Utilizing the anti-septic properties of Rosemary and Tea-tree oils to clean your face and help reduce breakouts. Deluxe Paleo Bar - Extra lather from tallow rendered by us from grass-fed beef fat with a creamy orange scent from citrus essential oils. Each Bar of Soap is Approx. 3 oz. Unscented Deluxe Butter. A blend of whipped oils similar to our Body Butter, but made with even more oils for extremely dry or cracked hands. 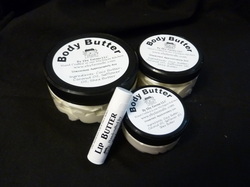 Lip Butter - Like the Body Butter with the addition of Avocado Oil which helps to prevent your lips from cracking and Jojoba to promote soft skin. An all natural deodorant with simple ingredients that work. Available in the traditional stick and non-traditional "swipe & wipe" tub. Liquid Laundry Soap: A natural laundry soap for HE machines and top loaders. We use it on everything from baby clothes to dirty, stinky work clothes. Natural Laundry Powder: A natural laundry wash for HE machines and top loaders. We use it on everything from baby clothes to dirty, stinky work clothes. The powdered wash works exceptionally well on stains and smells. It can be used as a stand alone wash or as a prewash. This product is cloth diaper safe - does not contain soap.